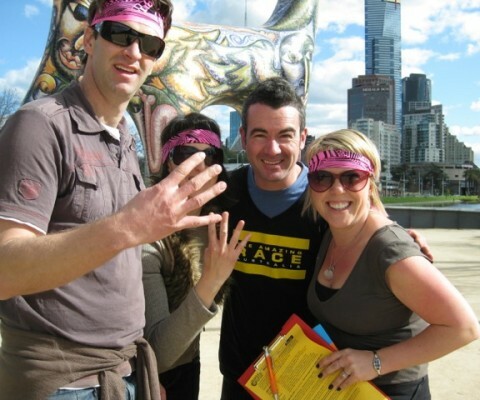 Fantastic Amazing Race corporate team building activities and events in Melbourne, Federation Square, South Bank and Docklands or St Kilda. Experience the thrill and excitement of your own Amazing Race through Melbourne’s vibrant heart next to the Yarra River. 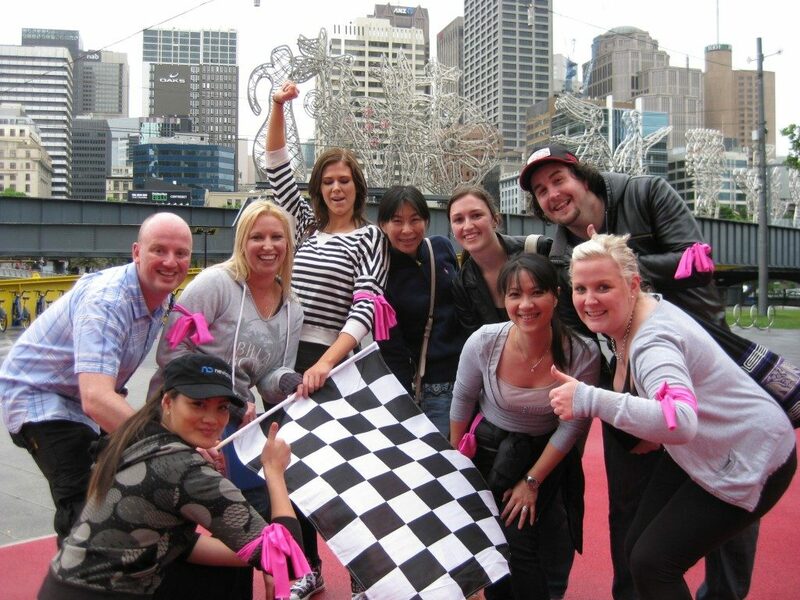 “Chequered Flag Amazing Race Finish” Test your skills, knowledge, talent and teamwork will be tested in a race to win The Amazing Race Melbourne Championship Trophy. Together with unlimited bragging rights! Ideal for Corporate Groups, Business Teams, Rewards, Incentives or just a great time together for Social & Friends Groups of 15+ are welcomed to participate. Amazing Racers may travel by foot, taxis, Melbourne trams, trains, bikes, taxis, gondolas, own or historic sports cars. Like we organised for FORD Australia sales teams. 4 more exciting inclusions like Eureka Skydeck level 88 or Pole Dancing. We supply Hummers, Helicopters and Harley Davidsons to generate the wow factor! Don’t miss out… Book now for an awesome EOFY or Christmas Events! We ensure the essential ingredient of Amazing Races is to be Amazing! No Lame activities or Scavenger hunts in disguise. Amazing race Marker Flags, Registration Mats and staff at Checkpoints. Receive real Envelopes at each activity location. Amazing Races are the most cost effective, short duration from 2-2.5hrs of immense fun! Amazing Races 2-3hrs revealing Melbourne’s heart; Culture, Chocolates and being talented at winning! Amazing Melbourne Races are the Most Popular for corporate group clients! Haighs Chocolates, fun team activities, Art… creative challenges. This is the team building activities choice and Rolls Royce for all Melbourne conference venues. From the Sofitel to the Langham. 14 activities in and around Melbourne CBD. Macedon Ranges, Hepburn Springs, Hanging Rock, Great Ocean Road and Yarra Wine Valley. Ideal for creating a mystery journey to your next destination. #5 WOW FACTOR TEAM and CORPORATE GROUP RACES with all the bells and whistles! A high quality premier Melbourne team building activities event that is bespoke. Guaranteed to delight your delegates special guests and VIP’s. You can do it all yourself or employ Amazing Races in Melbourne. We will take your teams on a journey. In and around Federation Square, Yarra River, Southbank, Convention Centre, Albert Park, Docklands or through the CBD. Uncover iconic cultural attractions, fashion, food, architecture, with unique surprises & team challenges awaiting your teams arrival. Integrating team communication, problem solving kills, strategic planning and using common sense collaboratively. Suitable for all corporations, departments and abilities. We match the pace and select amazing challenge activities that will have everyone involved & engaged. Timing is a minimum of 2 hours, with 3-3.5 hours being optimal for a quality team development exercise or team building activity. Our staff will develop, design and customise all content to match your requirements form start at any location and finish at any destination with presentations and awards professionally delivered in all function centers, conference venues, hotels and business offices. Starting from any Melbourne conference venues, hotels, city offices or workplaces. Your team will receive a briefing by our professional host and coordinator, a talented fun full of energy Phil Keoghan stand in. 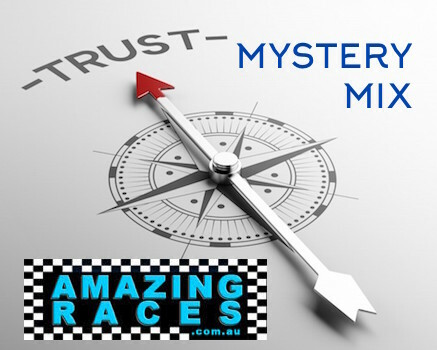 Amazing Races is the go to Melbourne team events company that will amaze your employees, staff and friends! From any Melbourne location to any destination. We create and custom design corporate events from your brief. Contact us for a free team assessment or social group event quote. The undeniably legendary status of receiving the Melbourne Championship Amazing Race Trophy! Engage in teamwork, problem solving & strategy skills. Accomplish Amazing Race challenges and improve team development dynamics. Enjoy energetic quality Team Building activities in an exceptional facilitated uplifting Melbourne events package! Receive GO-GO envelopes, providing instructions to the next Amazing Race Melbourne locations. Have a great fun time conferencing or celebrating actively. Locations are marked by flags and an registration mat with hosts greeting teams to register arrivals. “Congratulations – you are the 1st team to arrive”. Melbourne Amazing Racers registering their 1st place arrival! Once arrived, a TASK or CHALLENGE envelope reveals the team development challenge: Sculpting, painting, cycling, building, serving, eating, entertaining, repairing, climbing, paddling, competing, driving, searching, building, singing, playing. Content is customised to your interests, values or outcomes. Teams navigate to find clues, letters, numbers, codes, resources. Develop and test problem solving, planning, leadership, communication, negotiation and teamwork skills. Further building the best team spirit! Federation Square: Sculpting or Skitting a current affair! Unearth the architectural value of Melbourne’s development and unique history. Spencer Street Railway Melbournes Hub of Transport; Railed for time, teams navigate to pick up a checkpoint clue. St Kilda Rd: on the South Bank of the Yarra discovering Melbourne Arts and your teams creativity. For a different perspective on Melbourne, jump on-board a water taxi, gondola, cruise boat or be daring and kayak across the Yarra. China Town, Victoria Markets, Lygon Street Melbourne: Cultural team experiences & the very memorable EATING challenges! Docklands: Complete a team creative artistic insight challenge – getting to know your team on another level! Eureka Skydeck: Melbourne’s highest point – binoculars and team bearings identify the next checkpoint location. Old Melbourne Gaol: Escaping convict hand-cuffs off Victoria St.
Melbourne Cricket Ground, Flemington Racecourse, From Melbourne to Lorne via Geelong and The Great Ocean Road, Macedon Ranges, Hanging Rock, Wineries, Sandown Raceway, Tullamarine Airport all Melbourne destinations. +ve Investment in your greatest asset – your staffs happiness and well being. Celebrate Friendships. Friends – getting to know them for better, or for worse. Finding out who really has the talent to win an Amazing Race in Melbourne! Melbourne Events are customised to suit all Teams & Budgets. Receive a quote and special free offers by calling the Melbourne activities Coordinator Staff on Mobile 0459111129. Its been 11 years of Amazing Races in Melbourne starting off at The Langham South Bank through Federation Square. With FORD australia sales teams driving Jaguars to the Macedon Ranges and Hanging Rock. Since that day we have created over 200 Amazing Races within Melbourne for corporate groups like CBA, ANZ, EY, ESSO. Competing companies like Uplift Events, Corporate Challenge and Team Bonding attempted to copy our concepts. However the original is always the best. We ensure the quality remains well above the competition. Now its time for your team to experience the Thrill Factor.